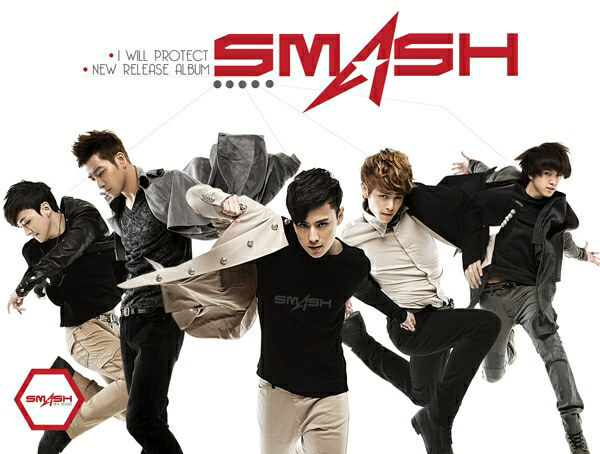 It’s rather hard to believe that Korean group Smash debuted in 2008 as I don’t think I really heard of them until they partnered up with the CEO of their agency, former H.O.T member Tony Ahn, to perform “Get Your Swag On.” They debuted as a six member group, but one member departed and now they are a 5 member group that is more active in Japan than in Korea. That, though, isn’t a surprise as there are tons of kpop acts more active in Japan than in their home country and it’s also an interesting thing to note that groups that did not take off for whatever reasons in Korea do relatively well in Japan. So after doing the dance song with Tony in March of 2012, Smash came back in November sans their CEO to promote their mini album 지킬께 [Jikilgge/Jikilkke]. While “Get Your Swag On” wasn’t a bad song, it wasn’t my cup of tea. 지킬께 was more up my alley even though it still has a strong dance beat to it. Plus, I fell in love with the entire album. Despite this, I still forgot all about SMASH until I was listening to their song and was wondering just who was singing. Of course, it wasn’t for their title song, but for their first song on the album. It’s fairly typical of me to enjoy other songs that aren’t the promoted tracks. There is also the flip side which doesn’t happen too often, but where I actually only like the promotional song and none of the others. This is my favorite song and I think showcases the vocals of the group well. It’ a beautiful ballad perfect for fall and it seems to be expressing sorrow over something that happened in a relationship. At the end of the song, the man is hoping the girl will meet a better man, and have a better love. This song reminds me of another kpop group, but with a more stripped down version of a similar song if that makes sense. I can’t remember which, though. It really has to do with the repetition of “nikkeoya” I think. This song just really screams typical kpop I guess. But it’s still a good song. Like 지킬께 this is definitely more of a dance song as there is a dance beat under the ballad. The verses of the song almost seem like it’s sung too fast. I think the song would be even better if it was actually slowed down a bit more. Other than that, it’s another good song.